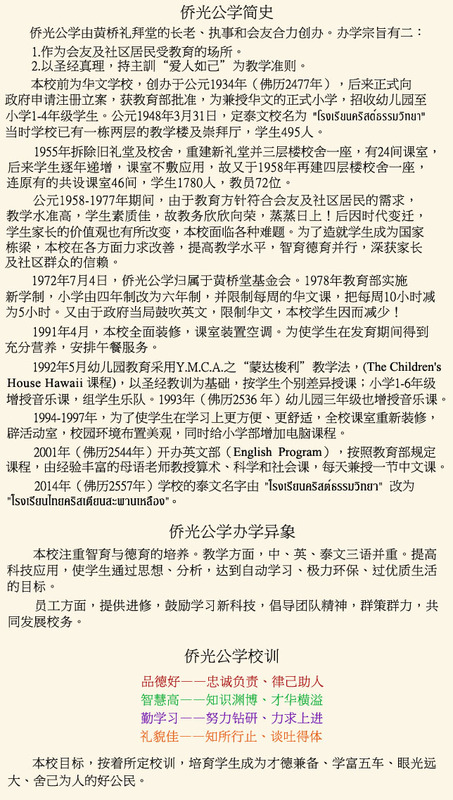 Founded in 1934, the School started by teaching in Mandarin Chinese. On the 31st of March, 1948, it was officially registered and received permission to cover Kindergarten to Prathom 4, following the Ministry of Education curriculum with Mandarin Chinese as an optional language. It was then changed to its Thai name “Christham Wittaya School”. In 1955, Reverend Graham Fuller returned to the United States and Reverend Clifford E. Chaffee replaced him. All buildings were demolished and a new building was built for the church. They also built a 3 – story building for the school, with 24 classrooms. The school had progressed well with more students enrolled. Therefore, in 1958, another 4-story building was added to the existing ones increasing the school capacity to 46 classrooms. In May 1992, the TCSS Kindergarten adopted the Christian Montessori system of the Y.W.C.A. following the Children’s House Hawaii curriculum. Music education was also added in the Prathom 1-6 curriculum and the school’s band was established. The music class was then extended to Kindergarten 3 in the following year. During the years 1994 – 1997, TCSS undertook various improvements and refurbishments of classrooms, activity rooms, and the overall environment. They also installed an air-conditioning system for a nice and comfortable ambiance for learning optimization. Computer skills classes were also added to elementary level. In 2001, the English program was introduced. 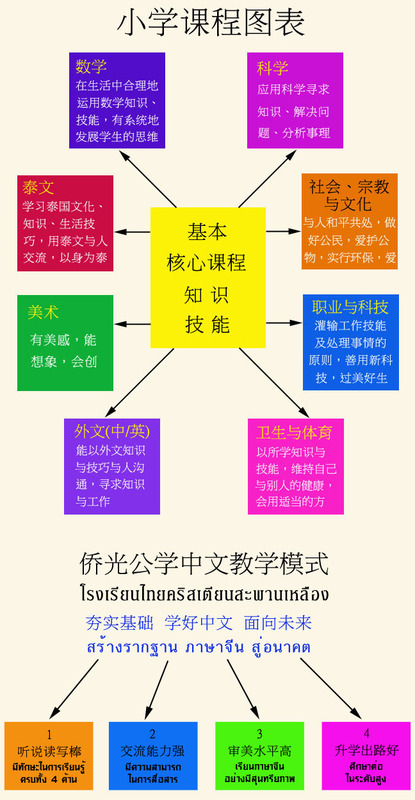 Both Thai and English are used in many academic subjects, including mathematics, science, social studies, computer skills, art and craft, music, physical education, whereas Thai, English and Chinese languages are taught by qualified and well experienced native speaker teachers. Its curriculum follows the Ministry of Education’s and has been developed and well adapted from International and Thai Schools. Morality means Discipline, honesty, responsibility, kindness, generosity and sacrifice for others. Intelligence means Knowledge, skills, thoughts and expression with decent consciousness. Learning Perseverance means Interested, eager to learn. Good Manners means Courteous manners according to Thai culture and good deeds. TCSS students, therefore, are filled with knowledge, capability, morality and ethics. They are eager to learn new things and have good manners. They are willing to sacrifice themselves for others, selfless and adhere to righteousness.